Barre is a french word that means, er, ‘bar’ or ‘rod’. 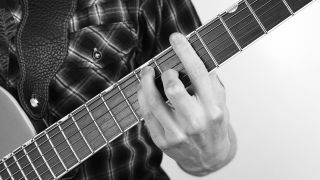 In guitar terms it refers to the technique of placing one finger across several strings (like a bar). The great thing about them is that there are four basic shapes that can be moved around the fretboard - so you can learn loads of chords. That’s right! These essential shapes are found pretty much everywhere. Rock, punk, metal, indie, blues, country are a few styles, but we can’t overstate how popular they are. The Ramones are a great place to start and Arctic Monkeys’ stuff is barre chord heavy too. Hang on - the good bit is coming! In the Em chord, four of the notes were open strings and, obviously, stayed open when you moved the rest of the chord up. So you need to place your first finger across all six strings at the 1st fret so those open-string notes also move up one fret. Since you no longer have any open strings, you can move this shape up and down the fretboard without any clashing notes. Have a look at the first tab example below and try the open E major chord too. We’ve looked at shapes that have their root (the note the chord gets its name from) on the sixth string, but there are also shapes with their root notes on the fifth string (see the second tab example). The principle is the same as the Em and E chords, but this time you start with open Am and A chords. Yes, well, barre chords are hard to start with and your hands may tire quickly. The weightlifter’s motto, ‘no pain, no gain’ doesn’t apply here. If your hand aches, take a few minutes off - you’ll develop finger strength gradually over time. Slide the E shape up one fret and press down across all six strings with your first finger at the 1st fret. You can move this shape around the fretboard. Notice how ‘movable’ barre chords are formed using open Em and E chords. Move the new shapes up the fretboard for a total of 24 chords. The D and Em chords in bar 2 use open A and Am shapes with a barre. Just like the previous shapes, these can be moved up the neck to play more new chords.